The Baldwin Historical Society and Museum maintains a collection of Baldwin artifacts and history. 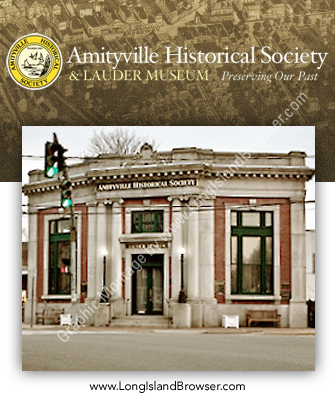 The William T. Lauder Museum, established in 1973, is operated by the Amityville Historical Society as a community, cultural and educational institution. The Museum provides an attractive home, where the memorabilia of Amityville's past may be collected, preserved and exhibited. The Historical Society strives to encourage interest in the preservation of our community's history and to ensure a means whereby future generations can relate to the past. A Historical Research Library is housed in the Museum to provide a unique collection of written works relating to the history of the local area. The development and growth of this special Library has proved to be an important resource for the study of community history. Special Historical Programs are presented by the Historical Society for the enjoyment and cultural interest of the community and it's visitors. All are invited to share in our rich historical culture by visiting the Museum.